Why do I have such a bad opinion about Tony Scott? I cannot even remember a single title apart from Top Gun – which was, of course, terrible, but also like 45 years ago. Checking his filmography, however, reminds me of a basket full of perfectly entertaining, yet utterly forgettable movies made since. Enemy of the State may be the only one that I would call a good film, but most others were ok at the time (not the previous ones, however. I remember being terribly bored when watching Pelham 1-2-3). And that is his topic: pretty pictures and quick edits wrapped around a black hole where other movies would have a script. 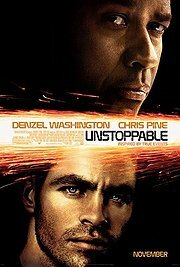 Same here: Unstoppable (or “Stoppable” as it was correctly renamed by BBC film critics) looks nice, has great editing involving on-train. Off-train, helicopter shots and whatever else the big action playbook lists. It has some good faces (the slightly over-used Denzel Washington, the hot Rosario Dawson, they boyish Chris Pine and the weird Ned Oldham. And Rosario Dawson. Rosario Dawson… ). It has high pace (up to 75 miles / hour) and some corporate sponsors that are slightly too visible. When it was over, I was surprised how entertained I was.